Peterhof Palace, also known as Petrodvorets is one of the most fascinating sights that today can be seen in Saint Petersburg. This historic Russian city boasts not one or two architectural masterpiece but also others as a symbol of royal power in the Russian Empire. Peterhof Palace is actually a huge complex of palace buildings and incredibly beautiful gardens, built by order of Peter the Great. Peterhof Palace was used as his summer residence and as such lies to this day incredibly wasteful, in which the royalty lived in Saint Petersburg. Today Peterhof Palace was turned into an interesting museum that has a lot to see and learn. In the former summer residence of Peter the Great, the museum exhibitions have been housed since 1918. In 1992, Peterhof is included in the list of most valuable objects of the Russian Federation and in the list of World Heritage by UNESCO. In Peterhof Palace there are held regular art exhibitions and exhibitions of art history. In the museum buildings of the former summer residence can be seen more than 500 paintings, more than 100 sculptures, authentic furniture, tapestries, art objects and more. The construction of the palace, park and the small port for ships sailing to the island Kotlin, started in 1700. Even today Peterhof Palace is known as the world capital of fountains as it is riched with so many, and is often referred to as the Russian Versailles. In the following centuries, the parks and gardens of Peterhof repeatedly changed, but in general the castle retains its original appearance and architecture of 18th century. The central place in the palace complex of Peterhof is given to the Grand Palace which was built between 1714 and 1725 with a natural terrace overlooking the sea. 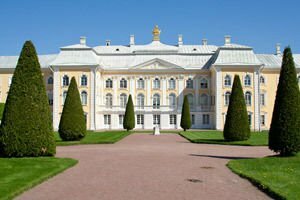 The main palace is the work of architects, Friedrich Braunstein, Mikhail Zemtsov and Jean-Baptiste Le Blond. A little later the Italian master, Bartolomeo Francesco Rastrelli transforms the facade of Peterhof in a complete baroque work of art. The accents in the interior of the building are pretty, but among them should not be missed is the Throne Hall, China Lobby, the White room and facial room, which are all works of applied and decorative art. Especially magnetic and attractive to tourists remain the parks and gardens of Peterhof . The amazing fountains of the 18th century are the most remarkable gardens. In general, the park consists of upper and lower parks, fountains and a system of channels and basins. Incredibly beautiful are the gardens of Venus and Bacchus. The complex system of the fountains of Peterhof won it worldwide recognition. Particularly impressive is the Great Cascade, which includes 64 fountains.